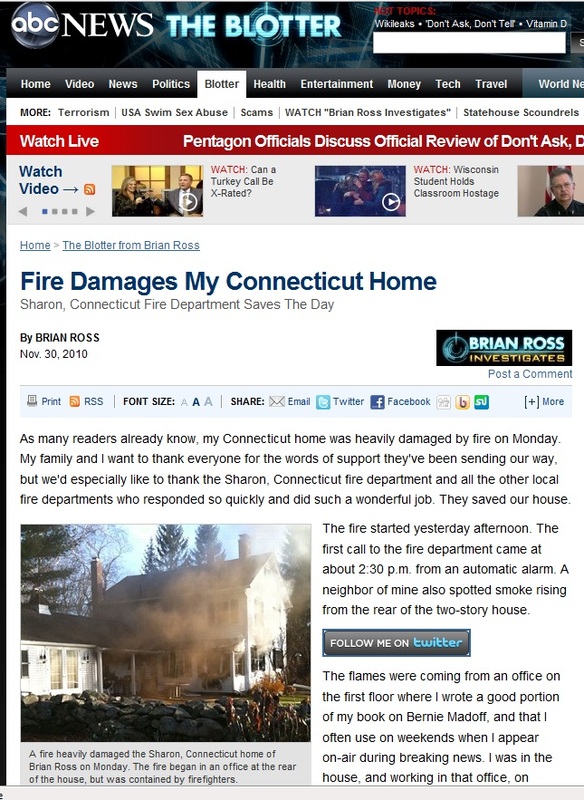 ABC News investigative reporter Brian Ross has a scoop: His house is on fire! And Brian Ross is on the scene. The flames were coming from an office on the first floor where I wrote a good portion of my book on Bernie Madoff, and that I often use on weekends when I appear on-air during breaking news. I was in the house, and working in that office, on Sunday less than 24 hours before the fire. Luckily no one was in the house when the fire started. According to Brian Ross, this is his weekend and summer house, and he was introduced to Lichtfield County, Conn., by Tom Brokaw, in 1986. It should be noted that Brian Ross' only sources for this story, besides Brian Ross (who didn't arrive until the fire was out), are unnamed government officials (or "firefighters"), so I'd take the whole thing with a grain of salt.